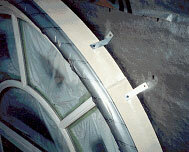 For Additional Information, Also See How To Install Cast Stone Fasteners and our How To Videos. Note: the parts are heavy and may need two men to lift some of the pieces. Or require machinery to lift and place stone products. The edges are fragile. Extra precautions should be taken not to rest weight on them. There are many ways to install that are acceptable and we certainly do not mean to imply that this is the only way. Before grouting, mask off joint edges with masking tape. This is very important. Stone is porous. If not taped, lime will leach out and make a fuzzy joint. Blue painter�s masking tape works best. Make sure stone is dry so tape will stick. Use regular mortar for installation. Leave 1" clear from surface then point up with matching sand mixed with White mortar mix. Do not use Gray Mix for pointing. Mix four parts sand to 11/2 parts White mortar mix for point-up. When grout has set up somewhat and after any final pointing up is done, remove masking tape. At this time, you may want to take a piece of short nap carpet or burlap and burnish the joints. This gives a better finish and makes the joints look more like the stone itself. Do not rake joints.